Purified and heated air is introduced from the bottom of the GFGS-60 High-efficiency Fluid Bed Dryer by suction fan and passes through the hole plate of funnel. In the working chamber, the state of fluidization is formed through the function of stirring and negative pressure. The moisture is evaporated and removed rapidly and the raw materials are dried quickly. 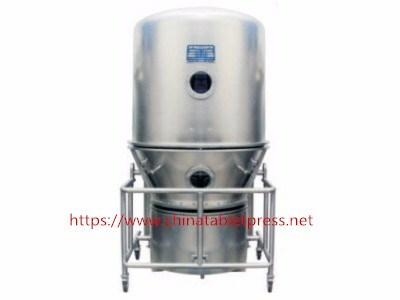 Purified and heated air is introduced from the bottom of the High-efficiency Fluid Bed Dryer by suction fan and passes through the hole plate of funnel. In the working chamber, the state of fluidization is formed through the function of stirring and negative pressure. The moisture is evaporated and removed rapidly and the raw materials are dried quickly. 1. Screw extrusion particles, rock particles, high-speed mixed granulation particles. 2. The drying of wet particles and powder materials in pharmaceutical, foodstuff, feed, chemical industries and so on. 3. Large granular, small pieces of and viscous materials. 4. The materials, such as konjak and polyacrylamide, whose volumes might change during drying process. 1. The structure of fluid bed is rounded so that it can avoid dead angle. 2. Inside the hopper, there is a stirring device so that it can avoid agglomeration of wet materials and forming channel flow during the drying process. 3. The materials are discharged in the way of turning over. It is very convenient. The discharged system can be designed according to the requirements too. 4. It is operated under negative pressure. The air is filtered. Therefore it is simple to operate and convenient to clean. It is an ideal equipment that conforms with the requirements of GMP. 5. The drying speed is fast and the temperature is uniform. The drying time for one process is 20-30 minutes normally.